US site Sea Of Tranquility write about Sunrise Auranaut and The Ocean Of Unspoken Words here. It is well written, and honest, thank you Steven. Tragik’s latest opus Tainted got a mixed review from French metal site Metal Integral. The original is here, and you can find a translation to English here. And last but not least some reviews for Still Living and their wonderful Ymmij opus. German site Musikreviews wrote about theme here. And Dutch site RockPortaal’s findings you can read here. We will try to translate to English soon, or use Google :). Writing about this particular band is not very simple. The Russians Sunrise Auranaut born as a studio project by multi-instrumentalist Vitaly Kiselev. The latter has created this special and interesting in some ways music project. The album in question is definitely not easy listening for those seeking fast and immediate melodies to assimilate at once, or who is looking for brute strength and raw. This is about a special blend of sounds and genres ranging from rock, metal, symphonic to progressive class. The influences made from it by The Ocean Of Unspoken Words are manifold. You can find reminiscences of Uriah Heep, Yes, ELP, but Kiselev not disdain even the mold prog purely Italian, just to understand what the ’70s. Yes, because the Russian composer seems particularly love our musical pride known throughout the world. And as if they merge into a single Goblin cauldron, PFM, New Trolls and everything that goes with it. It might appear at first listen wordy, but gradually grows the desire to penetrate ever further into this particular world also made a lot of psychedelic. Within this work we can find so many types of songs including some really compelling as The Secret Of Nightlife, or airier Who Is There, one of the most successful tracks. While with In a Room with Many Mirrors, we can easily remember the great PFM. In principle, although it is not easy to hold, after several plays the album still managed to convince and win a place in your album prog collection of all respect. It will not be for everyone, it recommended for those who feed on this particular genre which requires among other things probably more than one listening to be fully appreciated. It’s a well titled set, seeing as how this fully instrumental disc must rely on no vocals whatsoever to carry the keyboard and guitar-heavy vastness on offer, and `Ocean…’ takes the most grandiose and bombastic of elements from the music of Rick Wakeman, the Flower Kings, Genesis, Camel, the Par Lindh Project and Karfagen amongst others, delivering a set that symphonic-prog lovers will adore. `Perseids’ sounds like Rick Wakeman jamming with Renaissance’s Jon Camp and John Tout, a strong opener of fancy themes and classical elegance in amongst the whirring electronics. The title track `The Ocean Of Unspoken Words’ is one of the more ambitious pieces of the disc, full of grand orchestration-like synths and dreamy shimmering guitars delivering stirring reprising themes. `The Ocean of Unspoken Words’ is complete evidence of a talented artist growing in confidence, maturity and sophistication, delivering an immense work that comes close to being the equal of many of the higher-status acts currently performing in a symphonic style. This is story-telling prog as richly possible without utilising lyrics or vocals, and for fans of any of the above mentioned artists and progressive music proudly in the Seventies Prog tradition, this disc comes highly recommended and is composer Vitaly Kiselev’s finest achievement to date. With 4/5 stars we kindly thank Aussie Byrd Brother! 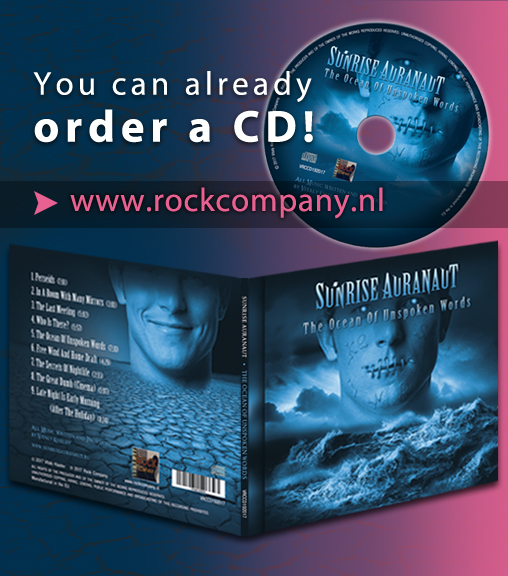 The first and even if we say so ourselves, very fine review for the coming SUNRISE AURANAUT album The Ocean Of Unspoken Words is published on One World Music , just click on the cover to read. Apart from coming up with one of the best album titles of all time, Sunrise Auranaut have created an album of progressive bliss for the ever growing throng of this revitalised genre, from each track we can hear cultured arrangements that thrill and carry the listener all along the way. Remnants of Yes, with a mild smattering of Emerson Lake and Palmer abound here; the percussion lifts the project with an undeniable sense of power and posture, In A Room With Many Mirrors a fine example of this bands cleverness. I grew up with a cousin that played Wakeman and King Arthur relentlessly and some of that you can find here. Listen though to the subtleties of tracks like The Last Meeting, one could easily be mistaken that perhaps Keith Emerson had reincarnated back into our time frame, you can’t keep a good rocker down! Sunrise Auranaut have created something a little special here, just listen to The Great Dumb (Cinema) and be amazed at the flexibility of tone, tempo and composition of arrangement. Take in the outstanding Late Night Is Early Morning (After the Holiday) and understand that within this album, a new era of progressive rock has been born, the era of Sunrise Auranaut. This is one album that has to be brought, has to be listened, this is a work that raises the bar in this genre by a mile. Congrats to Vitaly and thank you Steve!